Dirtdrop, what year is your 850? I believe it's a '92. I think that's the only year they used the flat purple paint. I had to give it to my daughter after I had second thoughts about giving her my PX-10. I've tried to talk her out of that heinous saddle, but she won't give it up. 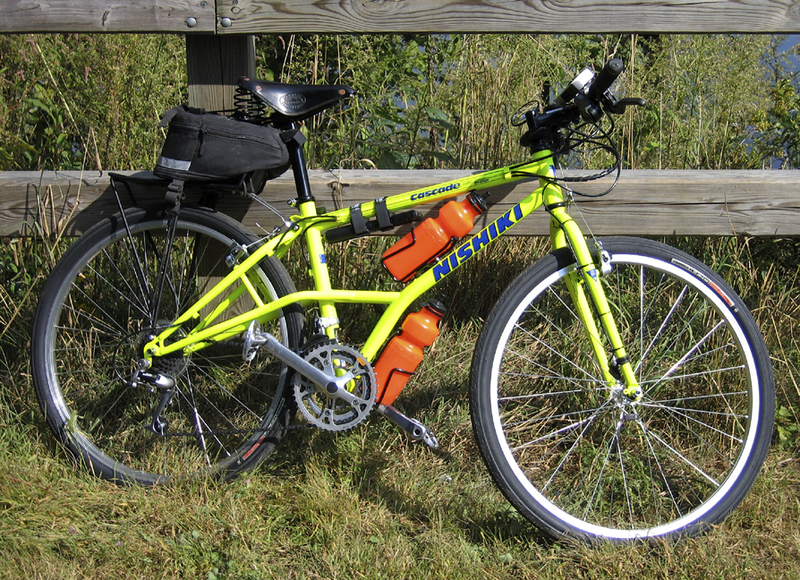 It's got a 9 spd drivetrain, but it also has some cool vintage parts, like the Nitto bullmoose bars and Hershey brakes. It's the only tig welded frame I've ever owned. I think I have a '96. There is only a single, large tube joining the seat stays to the seat tube though. I've not seen a picture of one with this feature. I've also noticed that the down tube is oval, being taller than wide where it joins the head tube, and wider than it is tall where it joins the bottom bracket. It also has a bit of a ledge on the fork dropouts which serve to hold the front wheel on, even if the quick release comes unsprung. Does yours have either of these features? My current mountain bike is a '95 KHS with a few older parts, is that already considered vintage? The frame on mine is very conventional, with round tubes. Yes, it has lawyer lips. I've been meaning to grind them off. It's a nice ride, but my heels hit the brakes. I think I'd like a bigger frame better. The Persons saddle is going on eBay. I should have bought a Brooks. 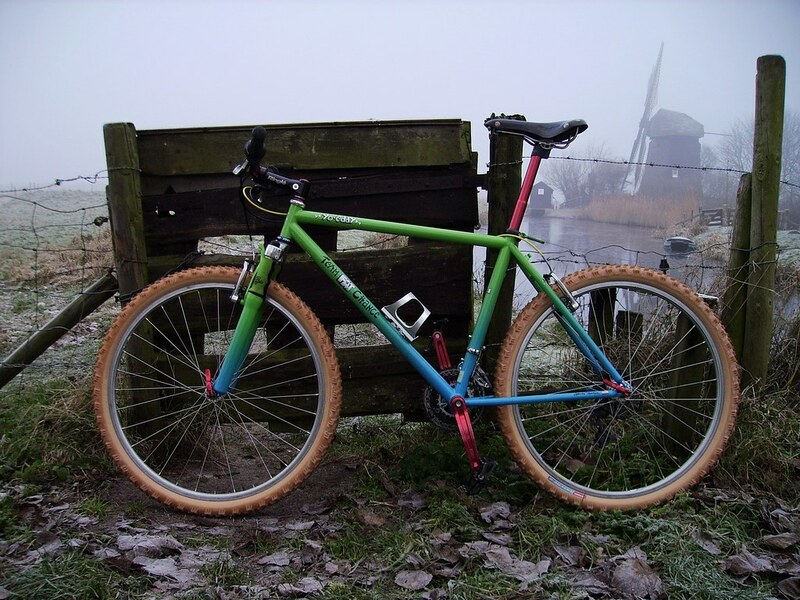 The frame is a '93 and I think it's the last of the lugged steel Trek MTBs. 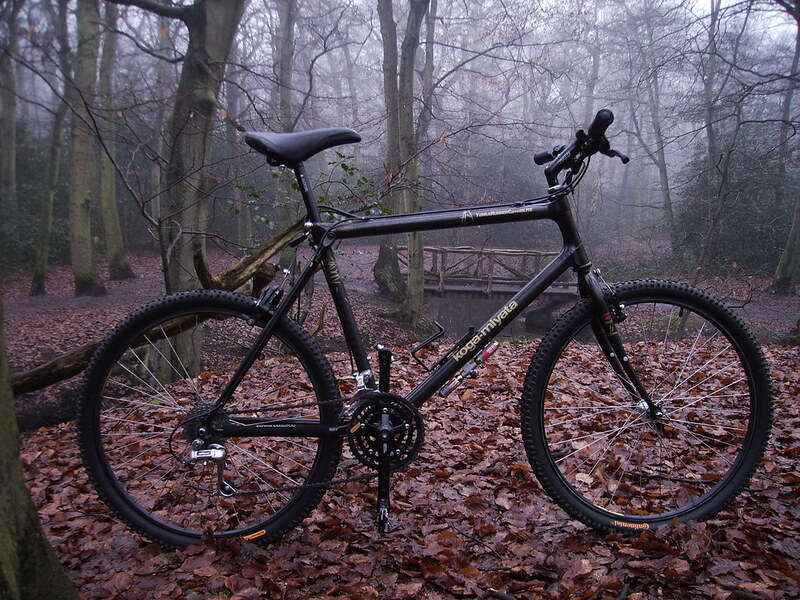 The frame is a '93 and I think it's the last of the lugged steel Trek MTBs. Yes, my brother has a '94 930 and it's plain old TIG welded. I see you didn't get the hot pink color that was available that year. I see you didn't get the hot pink color that was available that year. Funny you should mention that. I'm going to look at a hot pink one today. If it's decent, I'm gonna pick it up, overhaul it, and give it to my sister-in-law. "Love is not the dying moan of a distant violin, it’s the triumphant twang of a bedspring." does anybody make elevated-stay bikes anymore? i always thought it was a good idea from the anti-chainsuck point-of-view. If you want to make it a single speed, the magic gear for that frame is 46X18. Chain tension is perfect. I wasn't really interested in riding a single speed, but I thought it would be interesting to build one. I used a frame I got for $25 and mostly parts I pulled from other bikes. It turns out that it's so much fun to ride that I've been neglecting my other bikes. 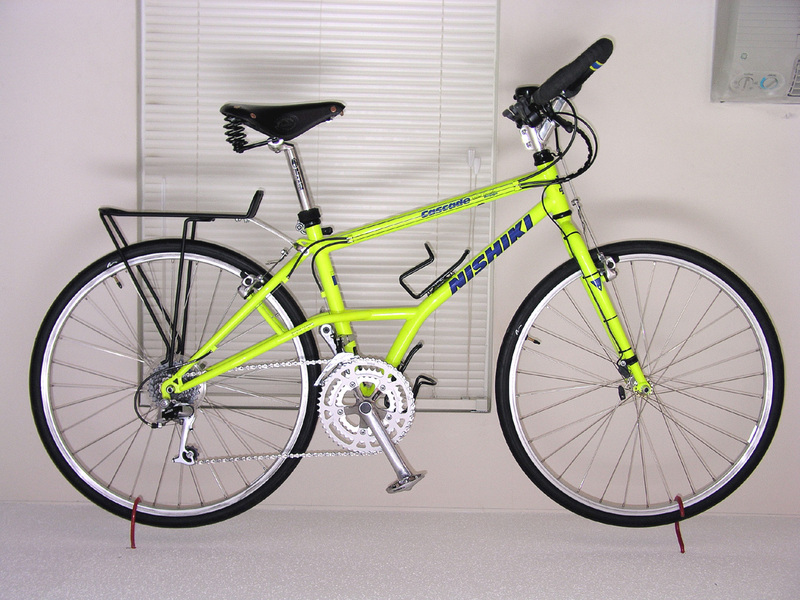 At one time the Nishiki Cascade was one of my favorite bikes, but then the Alien FS came out and I liked it better. That deep red with chrome stays, Mag 21s, and XTR components just looked amazing to me. It's been said before but it's worth repeating. Threre's a good reason there are no E-stay bikes on the market anymore. The design requires several more pieces of tubing and up to a dozen more welds. 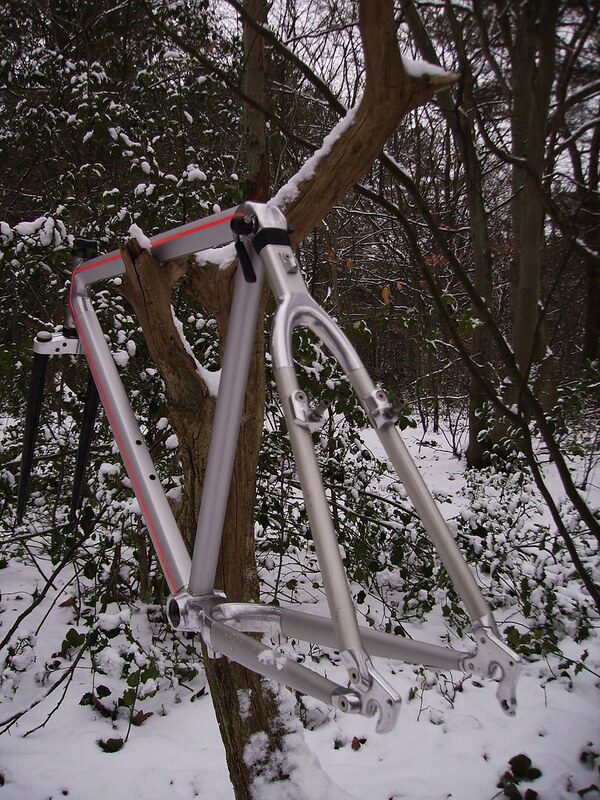 The end result is a heavier frame, more costly process and a flexy bottom bracket. A worn or dirty drive train will still produce chainsuck it's just that you wouldnt be sawing on the stays, which is only an issue if your frame is made of alu. or carbon. Most of those Nishikis (Cascade, Ariel and many of the Aliens) had steel stays anyway, so all you had to lose from a case of chainsuck was a bit of paint. That said, there's currently a 89 or 90 Ariel project hanging in my basement in all it's blue & purple on black splatter glory. It came to me really cheap and in excellent condition. I still love the freekbikes. Bikes: '75 Schwinn Paramount P-10, '86 Ritchey Commando, '87 Schwinn Cimarron, '91 Trek 990, '87 Schwinn High Sierra, '73 Schwinn Super Sport, '4? Schwinn New World, '76 Swing Bike. Sad to see it go ... (but baby needs a new college education). Couldn't resist joining when i saw this thread...and...here's my ride: 1993(?) Klein Rascal...pulled the frame off the shelf and built it from there up: White Industries Hubs, Avid brakes/Tri Dangles, XTR, Kooka Cranks, Bontrager Ti saddle, Mavic Ti rims (28 spoke in front, as I am a lightweight), Answer Hyper-Ends... the only thing that wasn't new was the first generation Manitou forks off my old Bridgestone polo bike. Stored for most of its life...this bike looks and rides like new! It's a '91 Yokota Yosemite with 1 1/8 threadless. Ordered them Saturday, came in on a Wed. Nice. it will get 26x 1.9 slicks and drop bars. No illusion. 24" back/26" front was a Cannondale gimmick for the first couple of years of mountain bike production. Great to see it! Funny how now the "thing" is 29" fronts and 26" rears eh? Cannondale was onto something. The frame looked really bad on eBay, but I went ahead and paid $25 for it because I wanted to build a beater with parts I had on hand. It turned out that the frame was pristine under all the dirt and grease, so I spent a little more on it than I had planned. I still don't think I have more than $200 in it. It's a '93, the last year they had a lugged frame. The tubing is True Temper OXII. The brake cables run through the bars and exit through holes I drilled in them. Don't try this at home. Couldn't resist joining when i saw this thread...and...here's my ride: 1993(?) Klein Rascal...Stored for most of its life...this bike looks and rides like new! 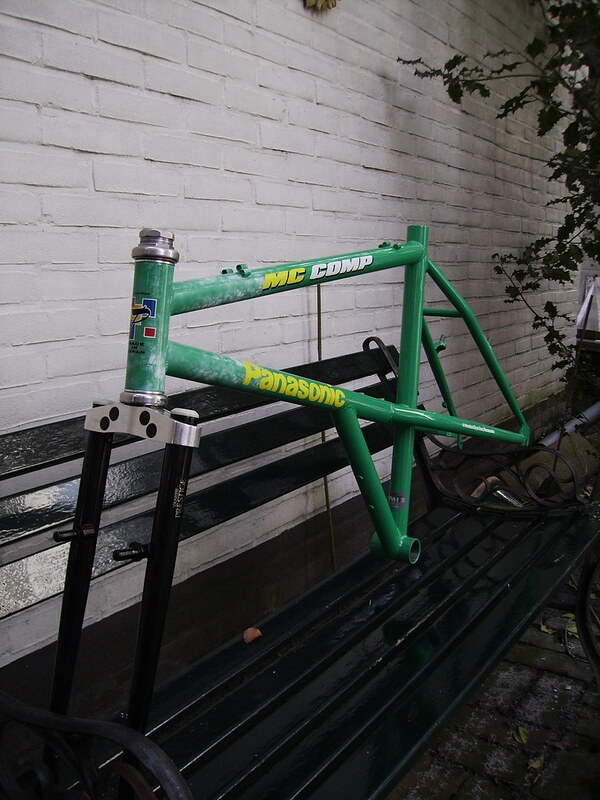 www.mtb-kataloge.de and look at the old Klein (and other) catalogs and find that this paint job was offered in '93. I'm going to be upgrading parts slowly and maybe put a cool rigid fork on it, we'll see. The parts on it are plenty good for now, so no hurry. One bike I'm getting parts to build up is a NOS 1990 Attitude, this is gonna be sweet to ride one of these again. Thanks for the catalog link...I used to have the original rigid fork for this bike...but in the many moves since it was built, that may have vanished. It's a sweet little ride...felt like it weighed nothing after my old 89 Bridgestone with Grip-shifts/Manitou (attached)! where is the picture with the wooden bridge? I recognize it! Nice bikes, Elev12k! They all look to be in such good shape, it's amazing......What saddle is that on the Fat Chance? Nice bikes, yes, but that beautiful scenery is what really caught my attention! Friends don't let friends use brifters. your vintage MTB collection is insanely amazing, I am totally blown away by how cool those bikes are and can't imagine the collectable value of those in years to come. you will be able to retire on them!